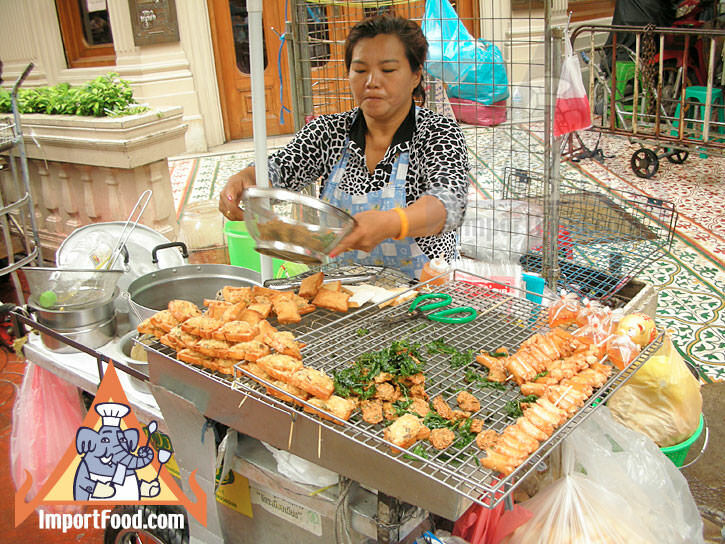 This vendor offers three deep-fried snacks in the Sampeng district of Bangkok. The signature dish is "Khanom buang na moo" which is bread covered with minced pork, then fried. 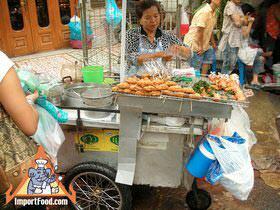 There are also fish cakes for sale, which are fried with fresh basil leaves, and hot dogs on a stick. Thai hotdogs are often served with spicy ketchup. Her cart features one large pot, heated with a tank of propane stored underneath. On each side of the large pot are smaller, shallow pots which drain directly into the large pot. She uses a wire basket on a long handle to lift the food out of the hot oil and into stainless colanders which sit on the smaller pots. The offerings here are all tasty snack-foods, which are quick and easy to make at home in addition to readily available from vendors. Shrimp, ham, crab meat, canned tuna, chicken or beef can be used instead of pork. 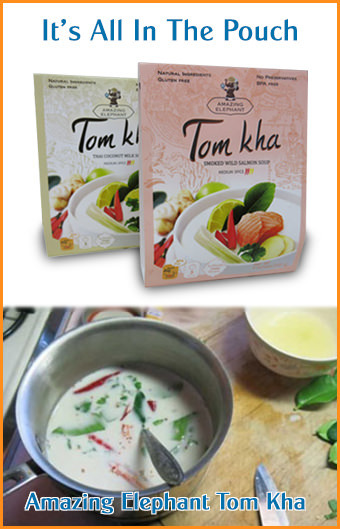 Serve with fresh ajad (recipe for ajad).